I write this post with mixed feelings. Elated as I have achieved the 100 followers mark. Starting from an anonymous blogger achieving this peak would not be possible had it not been for you my friends. A Big thanks to all of you!! The fact that I have hardly received any entries for my event the Lets Get Stuffed Event is a big disappointment. Well that’s life! Here is one of my experiments that was not much of a success. 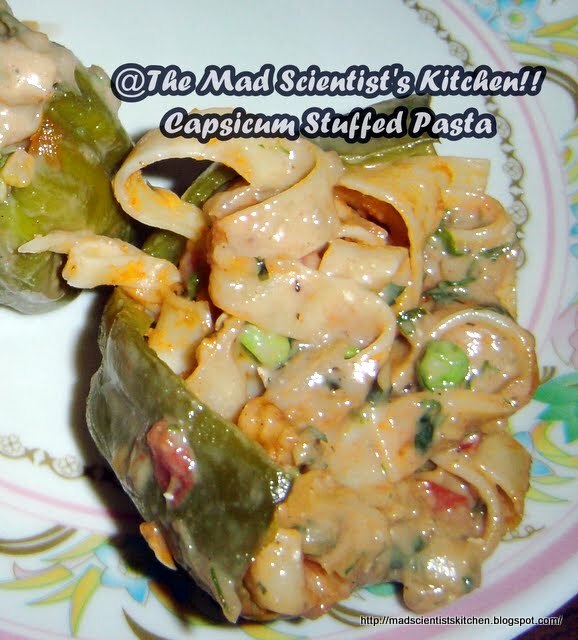 What I did was made pasta in tomato sauce stuffed it in the capsicum. My husband poor lamb ate it but my kids told me that I better stick to pasta in white sauce only. So that’s that. Personally I love all my creations so this was good but not good enough. I am open to suggestions on this. 1. To make the tomato puree, wash and cut a small cross at the stalk of the tomato. 2. Drop the tomato in hot water for about 10-15 minutes. Then peel and discard the skin grind the rest of the tomato. Set aside. 3. Heat the oil add hing/asafoetida add the basil leaves and oregano fry for about ½ a minute. 4. Add the tomato puree, stir and bring to a boil. 5. Add the rest of the ingredients and reduce heat. 6. Simmer till the mixture thickens. 7. Next boil the pasta as per the instructions on the packet. 8. Cool under running water and then toss in olive oil. Keep aside. 9. Cut the capsicum and clean the insides. 10. In 1 tsp of olive oil add salt and the oregano. Apply to the capsicum inside. Let this rest till your sauce is ready. 11. 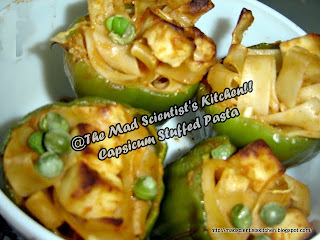 Once the sauce is ready reserve 1 cup full add the paneer to the rest of the sauce & pasta and mix well. 12. Stuff the pasta in the capsicum and grill on in the griller with both the grills on for 15-20 minutes till the paneer is grilled. I need 18 minutes. 1 13. Before serving top the capsicum with the reserved sauce. Sending this to my event the The Lets Get Stuffed Event started by Vatsala of Show and Tell!! Brilliant! 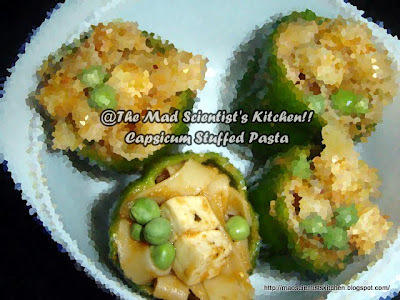 Excellent delicious looking Stuffed Capsicum. Wonderfully prepared. sound very interesting n innovative.. Seriously very tempting stuffed capsis,yumm! creative ! will definitely try out! Wow.. 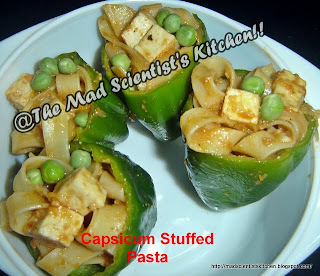 Very innovative & Yummy..
Congratulations on your 100+ followers. Pasta stuffed in capsicum looks very unique and yummy! Innovative recipe …. Loooks tempting … Happy to follow u ….